We at PSIC originally studied Agile Therapeutics (NASDAQ:AGRX) in early 2015. Now it has been two years, the long waited “make it or die” new phase III trial result was released in early January. Although the pearl index improved from 5.76 in previous trial to 4.80, it is still well above the highest approved pearl index (3.19 for Quartette, 2013). Despite the company sees the data as “positive”, the market is overwhelmingly negative and punished the stock with sell off. Here I present a complete investment thesis on AGRX, including a risk/benefit analysis to argue its FDA approval and Buffett’s four rules on value investing. FDA is committed to provide safe, effective, affordable and convenient products. Twirla, as a patch, is going to be THE most convenient CHC product. Affordability is not a problem. Thus, safety and efficacy is the core issue here. 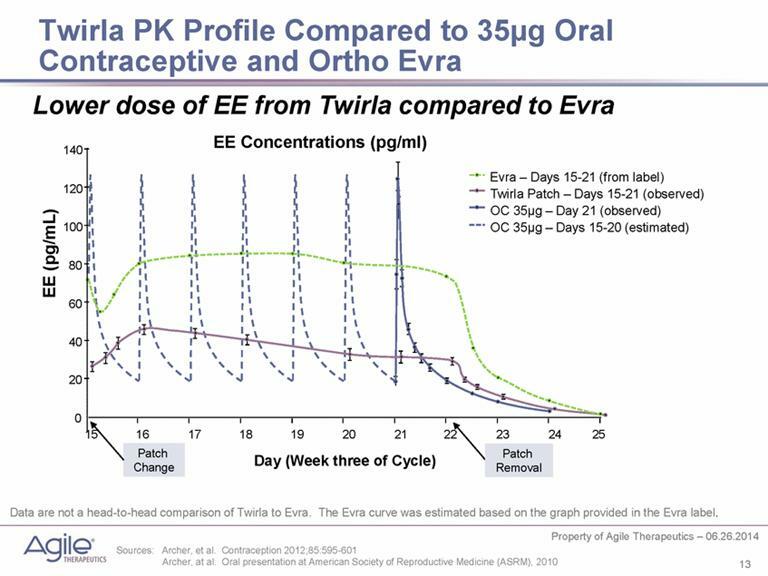 As a transdermal patch, the PK curve of Twirla is much smoother then the spikes of oral CHCs. As a low dose product, it is only half the dose of Ortho Evra patch. Old Ortho Evra patch, known as generic “Xulane”: as shown above with Quartette and notoriously known, Ortho Evra has serious side effects, sometimes life threatening. 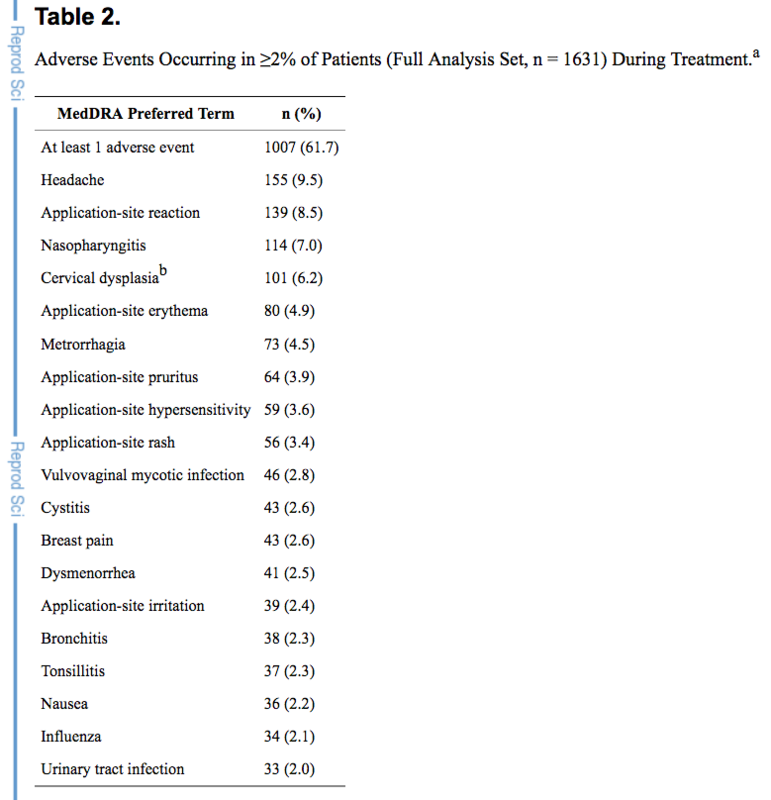 Common Adverse Reactions (≥ 2%): vaginitis (13.8%), headache (including migraine) (11.2%), mood changes (e.g., depression, mood swings, mood altered, depressed mood, affect lability) (6.4%), device-related events (e.g., expulsion/discomfort/foreign body sensation) (6.3%), nausea/vomiting (5.9%), vaginal discharge (5.7%), increased weight (4.9%), vaginal discomfort (4.0%), breast pain/discomfort/tenderness (3.8%), dysmenorrhea (3.5%), abdominal pain (3.2%), acne (2.4%), and decreased libido (2.0%). Twirla is safer than all these products with a wide margin. Upper bound of 95% confidence interval. While improving PI from 5.76 to 4.80, the new trial also achieved a tight UB of 95% CI at 6.06. As the company reminded us and I fully believe, many factors contribute to the higher pearl index. Obese women. Plenty literature including a 2015 FDA meta analysis concluded that obesity is a major risk factor for contraceptive failure. Obese women were historically excluded from CHC trial. Better testing: Newer technology can detect early events of pregnancy, previously non-detected. Demographic: Certain ethnic groups have high risk of non-compliance regardless of obesity. Stringent design: cycles using backup method or lack of sexual activity will be excluded in analysis. As a result, FDA require new contraceptive trials to be designed like real world, including obese women, diverse demographic population etc. The pearl index is creeping higher in general. The Creeping Pearl: Why Has the Rate of Contraceptive Failure Increased in Clinical Trials of Combined Hormonal Contraceptive Pills? 15a. Is there a pregnancy rate that would be unacceptably high, regardless of the risk/benefit balance of the product? 15b. If so, what would that rate be? Questions 15a and 15 b were discussed on Day 1 and revisited on Day 2. The answer below reflects the input from Day 2. The committee endorsed the concept that substantial flexibility should be exercised in accepting given point estimates and upper bounds of confidence intervals for new applications using active control trial formats. For example, for an agent with an indication or biologically plausible rationale for markedly lower risk or other positive side effects (e.g., lower rates of ovarian cancer) a reasonably high upper bound for a failure rate might be acceptable (e.g., 6 to 8%) whereas for a proposed new agent without novel claims or other positive features, a far narrower upper bound might be acceptable (e.g., 3%). However, the committee was unanimous in its desire to make clear that arbitrary limits be avoided in order to promote the widest range of new contraceptive products being developed and brought to the market. Please refer to the transcript for a more complete description of the discussion.– Most abstained from giving and exact point estimate or upper confidence interval. The key point to emphasize is that you have to provide all the information to the clinician and the patient in an easily understandable format in labeling and then let them make the final decision on which product is most appropriate for the patient (i.e., caveat emptor). Its higher pearl index is justifiable. Superior safety profile strongly favors Twirla approval as a new option for women. The only patch: safe and convenient. If approved, Twirla will replace Xulane as the only patch in the market. And women love “the patch”. Patent and exclusivity. 13 patents covers till 2021-2032. Eligible for Hatch-Waxman exclusivity. Follow-on products. If Twirla gets approval, the company has small patch candidate products in the pipeline to fully realize the patch potential in women’s health. Unique position in the foreseeable future. Birth control on the horizon: 2016 edition. There is no real competition coming. The company website provides basic information about the management. CEO was introduced on firecebiotech when he took position. The newly recruited Chief Commercial Officer was responsible for the marketing of Ortho Evra, the most successful contraceptive launch ever. No insider selling. source: insidertrading.org. Both the management and major shareholders are still on board, even after the “disappointing” results. CEO Al Altomari: charity and speaking. I found the CEO is very into charity. As listed on the company website, Al Altomari is the vice chair of Board of Trustees at local soup kitchen TASK. His LinkedIn posts are all about charity events. I found he also sounds a decent person as he speaks at investor conferences. Over-estimate trial enrollment. One thing I didn’t like about the management is that they kept postponing the estimates on trial enrollment. Eventually, the enrollment was completed in 4Q2015. Overall, Agile Therapeutics has a team of able and trustworthy executives. According to 10-K, AGRX has cash value of $30M and book value of $42M. That equals per share value of $1 ~ 1.5. IPO price was at $6; recent private placement was $5.85; recent secondary offering was at $6.35. The stock is hit by overwhelmingly negative response to phase III data; no expectation is priced-in. Upside estimates: Minimum market cap $500M (simple took over $150M annual sales of Ortho Evra, give 3X P/S; $16/share). Optimistic market cap $5B (10% market share with $1B peak sales; 5X P/S reflecting optimistic valuation and follow-on products; $160/share). Update 2017.12.17: consider August 2017 offering of 5.4mil shares, now AGRX has 34.2mil shares. I expect another dilution to 40mil shares. New estimates will be $12.5 – $125/share. 2.5x – 25x potential for current $5 price. As of 4.9.2017, at ~$3/share, it is half the price of IPO and later offerings. AGRX sees 50% downside risk to liquidation value while offering potential 5X ~ 50X upside upon approval. As a new formulation, Twirla has nothing to worry about like those new drugs. The bottom question is whether the risk/benefit profile worth approval as a new option to women. Based on the analysis above, we believe it will be approved. At current price of ~$3, AGRX offers substantial potential gain with minimal downside risk.